The Mangalarga Marchador is fast and smooth, with a natural amble known as the Marcha for which the breed is named. The feet move alternately lateral and diagonally. When there is more time spent in lateral pairs, it is called Marcha Picada (like the sauce). It is often described as a broken pace. Where there is more time spent in diagonal pairs, it is called Marcha Batida (ba chee da). It is often described as a broken trot. In recent years, although not yet recognized as a separate and distinct marcha, there has been a third category describing where the movements diagonal and lateral are equal, and it is called Marcha de Centro. 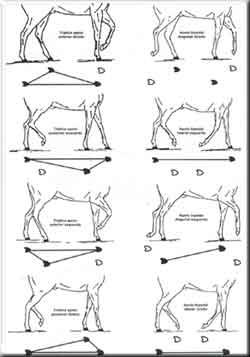 In all of the marcha gaits, due to the moments of triple hoof support and always having one foot on the ground, there is no upward bounce or total suspension in the air as with a trot or pace. Thus, the rider feels secure and comfortable. The marcha can reach speeds of 14-18km per hour without breaking gait. Which is better? The marcha picada is sometimes considered the smoother of the marching gaits and the marcha batida the more athletic of the two marching gaits. But, the gait you prefer is often a personal choice and may be influenced by the discipline you pursue or the terrain where you ride. But, what better way to explain the gaits than to see them in action? Listen to the difference. Often if you can hear marcha picada even if your eyes deceive you.